When I’m researching a particular aircraft, I often want to know more about its parent unit and the pilots who flew it. However this information can sometimes be difficult to find, particularly in a concise and focused format. In this context, Phil Listemann’s two series of books on “RAF, Dominion and Allied Squadrons at War” and “Famous Squadrons of World War 2” are an excellent resource for anyone with an interest in Commonwealth squadrons of the 1940s. The titles being reviewed here, on Nos. 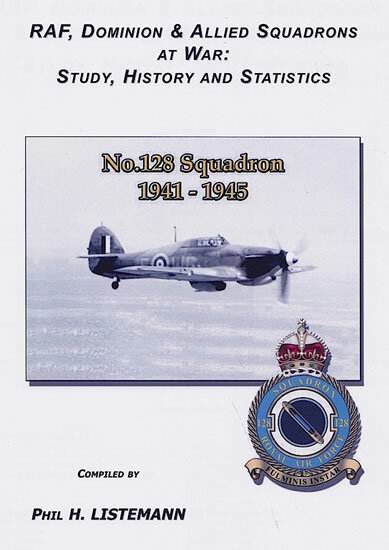 128 and 443 (RCAF) Squadrons, are from the first of these two series, and notwithstanding their modest length (approximately 20 pages each) contain a huge amount of material on each unit. Main equipment – while only a few lines long, this section usefully lists the aircraft types operated by the unit during the period covered by the book. For example, No.443 Squadron flew Spitfire Vs (February-March 1944), Spitfire IXs (March 1944-March 1945), Spitfire XVIs (January 1945-January 1946) and Spitfire XIVs (January 1946-March 1946). Code letters – another very brief but useful section, listing the various code letters and numbers used by the unit. For example, No.128 Squadron used the codes ‘WG’ on its Hurricanes in Western Africa, and ‘M5’ on its Mosquitoes in Europe. Squadron history – a detailed summary of the unit’s history from its establishment to disbandment/reorganization. Squadron bases – self-explanatory but again very useful. For example, all 14 bases used by No.443 Squadron in France, Belgium, Holland and Germany between June 1944 and May 1945 are listed, along with the dates of movement between each base. I: Squadron Commanders and Flight Commanders – this table includes details of name, rank, serial number, origin (ie RAF, RNZAF, RCAF etc), and dates in position. V: Aircraft losses on operations – each loss is described in a brief paragraph that explains the reason for the loss and the fate of the aircrew involved. Details of the aircrew and aircraft are also provided. VI: Aircraft losses in accidents – as per Appendix V.
VII: Aircraft serial numbers matching with individual letters (including mission totals for multi-engine aircraft) – a very useful table for identifying specific aircraft. VIII: Nominal roll – list of known pilots posted or attached to the squadron. Key information from these appendices is also drawn together in a one-page summary of the unit’s operational activity. After the appendices are several pages of excellent black-and-white photographs, mainly of squadron aircraft but also of pilots. These are of good quality and size (no more than three to an A4 page, and usually less), and also well reproduced. Selected aircraft from these photographs are then presented in a series of full colour profiles. Beautifully printed on glossy paper and accompanied by a representation of the squadron badge, these profiles are an excellent way to conclude each book. It’s important to note that these studies are not commercially produced books, but self-published by Phil who prints, binds, numbers and signs each volume. As a result, binding quality is not quite to the standard of most published books – several pages of each volume have fallen out as I’ve flipped back-and-forth through them (although I’ve had this happen with expensive books as well!) Anyway this doesn’t actually matter, because each volume is slim enough to be easily accommodated in a plastic sleeve or ring binder folder; much more important is the wealth of information inside. Each of these studies has involved an enormous amount of research into the history of Nos. 128 and 443 Squadrons. And there are many other titles in the series: 11 have already been published, including three on Eagle squadrons, while at least seven more are currently under preparation. These books are a perfect starting point for anyone wanting information on aircraft or pilots of Commonwealth squadrons during World War 2, and as a result are very highly recommended.